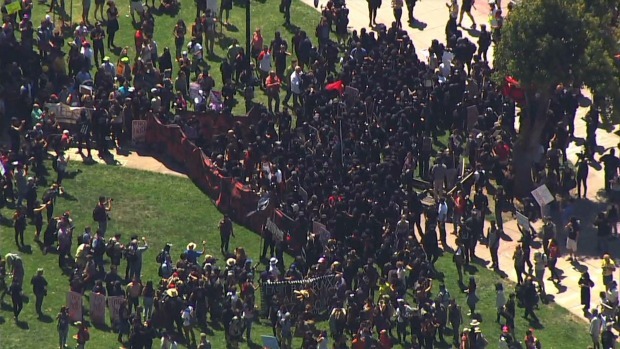 Black-clad anarchists on Sunday stormed into what had been a largely peaceful Berkeley protest against hate and attacked at least five people, including the leader of a politically conservative group who canceled an event a day earlier in San Francisco amid fears of violence. Pete Suratos reports. Berkeley police arrested 13 people during the demonstrations, two for felony assault and 11 for violating weapons or apparel rules. 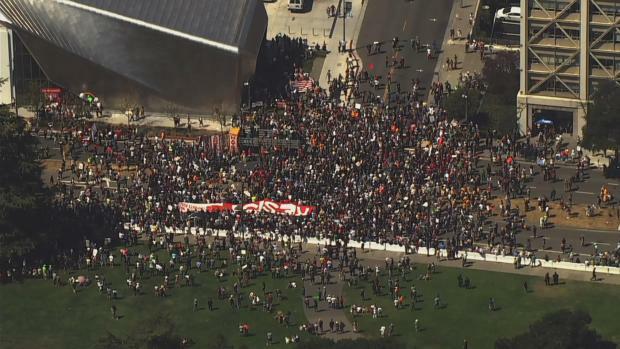 One officer was injured amid the protests, according to Berkeley police. Six others also suffered injuries, resulting in two people being sent to the hospital. 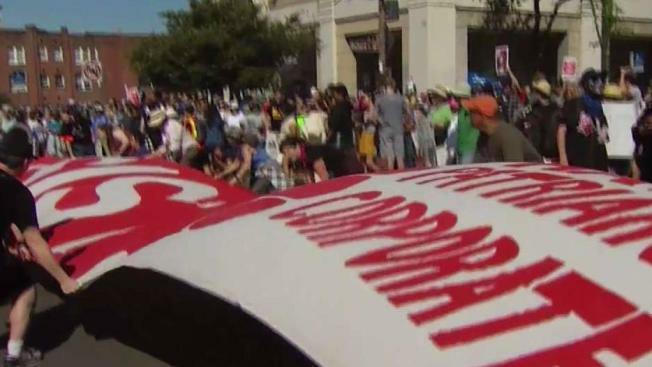 A planned right-wing rally in Berkeley was called off Sunday, but demonstrators still became entangled in violent scuffles. 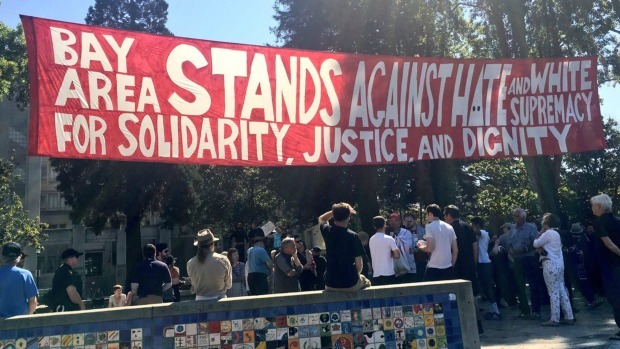 A crowd of demonstrators gathered at the Crescent Lawn on the campus of the University of California, Berkeley to challenge hate. 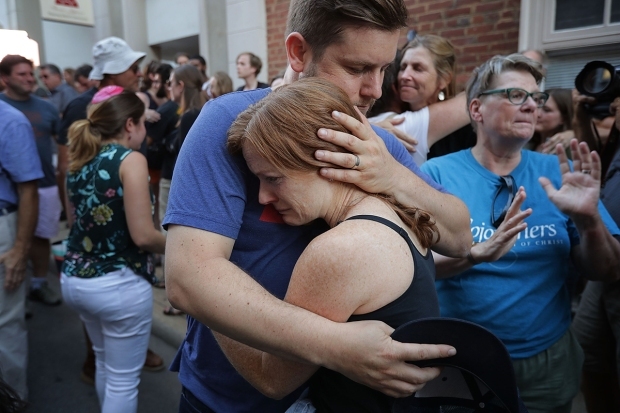 Police pulled one supporter of President Donald Trump out of the park over a wall by his shirt as a crowd of about two dozen counter-demonstrators surrounded him and chanted "Nazi go home"' and pushed him toward the edge of the park. At least two people were detained by officers for wearing bandannas covering their faces. Alt-right figure Johnny Benitez, who flew in from Southern California, was escorted out by Berkeley police to a car, along with Irma Hinojosa, a member of the Southern California group Latinos for Trump. NBC Bay Area's Riya Bhattacharjee, Gillian Edevane, Jennifer Gonzalez, Brendan Weber and Rhea Mahbubani contributed to this report.